South African Wayne Ferreira battled back from a painful groin injury to win the Mercedes-Benz Cup in Los Angeles last year, which included a dramatic third set magician's act in a 6-3, 4-6, 7-5 win over top seed Lleyton Hewitt. The classic battle lasted 2 hours, 28 minutes. Jan-Michael Gambill and Travis Parrott took home the doubles title. 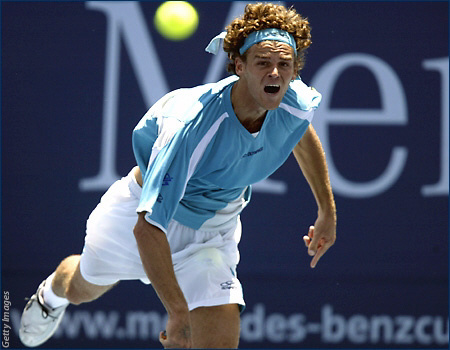 Gustavo Kuerten of Brazil in action against American Eric Taino during the Mercedes-Benz Cup, July 31, 2003.